SMBs who have 250 or less personal computers can exchange their existing hardware and get credit points to use Microsoft Azure, which is their cloud computing platform. It’s an exclusive 3-month scheme, launched only for the Indian market. Business owners can call at Microsoft’s toll free number at 1800 3070 4660 or login to to get this offer. Microsoft Authorized Hardware Recycle Partner will evaluate the value of the hardware and based on this value, the business owners will get Azure credit points which can be used to avail their Cloud computing service. For Mumbai region, Microsoft has partnered with Just-Dispose, who will collect the hardware, provide a purchase acknowledgement and suggest a value which can be redeemed on Azure platform. Released in 2010, Microsoft Azure is one of the hottest Cloud platforms existing today, the foundation of which was laid by current Microsoft CEO Satya Nadella. Using Azure, business establishments and developers can build, deploy and manage applications using a global network of datacenters spread across the world. Cloud computing on Azure has gained immense popularity as its growing at a rate of 200% annually. Public Cloud Computing is slowly getting traction in India as the current market of $423 million is expected to touch $1 billion by 2017. 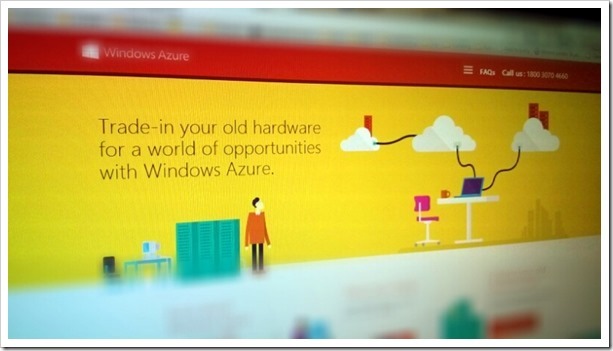 Microsoft admitted that Azure is getting much popular in India as they are getting close to 2000 customers every month. This figure is quite impressive, considering that there are almost 50 million SMBs in India, out of which roughly only 5 million use PC in their business operations. Microsoft is planning to fully utilize their strong network of 10,000 partners spread across 250 Indian cities to make this scheme a big hit. Microsoft already has some of the biggest corporate players as their customers such as Getit, Mobius Knowledge Services, E-reasoning and healthcare organizations like Fortis Healthcare. Microsoft has played their cards really well here as the growth opportunities in the Indian Cloud Computing domain are immense. It would be interesting to watch how many SMBs actually covert to Cloud computing after this unique initiative by Microsoft.